Environmental justice addresses issues of: (1) unequal distribution of resources such as clean air and water, healthy food, homes, parks, places to walk and sit in public, etc. ; (2) inaccessibility of public goods and resources because of transportation, cost or discrimination; and (3) exclusion from facilities and full participation in decisions about one’s community largely because of poverty, prejudice, race, income, recent immigration, or other marginal status. This event will feature case studies addressing a myriad of environmental justice issues, presented by a panel representing the fields of landscape architecture, planning, and community advocacy. Molly Bourne, RLA, ASLA, Principal, Mathews Nielsen Landscape Architects, P.C. Molly Bourne is a Principal at MNLA, a landscape architecture firm known for reinvigorating, healing, and mediating places. She brings over 26 years of design experience to each of her projects in which she consistently leverages a combination of award-winning design talent and creative collaboration. Molly’s consistent passion and commitment to excellence have driven her design teams toward the conceptualization of numerous renewed and transformed spaces within the urban fabric of New York City and beyond. Philosophically, Molly’s guiding notion is that if a solution is correct, it will enhance the environment, make it beautiful and be able to withstand forces both manmade and natural. Molly holds a Bachelor of Arts in Landscape Architecture from the University of Florida. She actively fosters the future of design through the ACE Mentor Program for New York City high school students and as a guest critic at the University of Pennsylvania. In 1994, newly licensed Elizabeth Kennedy responded to an ad in the Amsterdam News seeking scope writing services for community gardens in northwest Harlem. What developed instead was an idea for an institutional platform stewardship of upper Manhattan as a natural system. EKLA’s first project—the draft blueprint for urban open space conservancy—became a seminar at City College and a symposium at Harvard GSD. More important, it formed the basis of the firm’s ensuing work preserving cultural heritage through sustainable site design and management. Elizabeth, who is a Design Trust for Public Space fellow, will share this project’s back-story and how this tiny contract built a practice rooted in social advocacy. Now in its twenty-fifth year as a landscape architecture firm, Elizabeth Kennedy Landscape Architect, PLLC remains committed to practicing within the social advocacy and environmental justice domains and continually strives to bring client vision to its full potential. 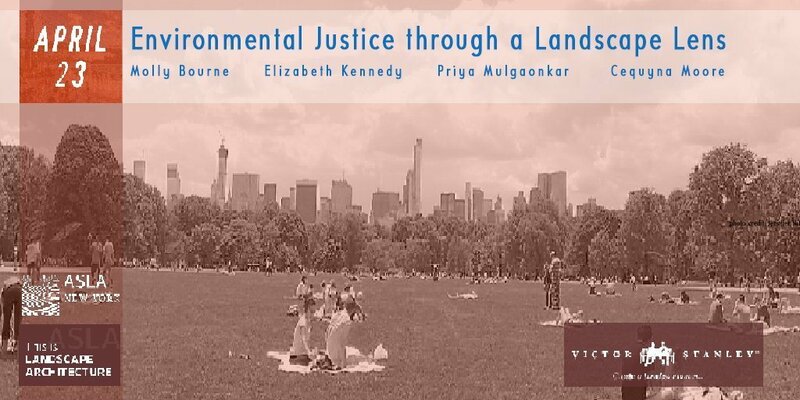 Priya Mulgaonkar is the Resiliency Planner for the NYC Environmental Justice Alliance, where she leads city and state-level climate justice advocacy campaigns, as well as resiliency work related to green infrastructure and air quality equity. She previously served as a Campaign Organizer for Environment New York, working to build a state-wide coalition urging Gov. Cuomo to commit to 20% solar energy by 2025. She also previously worked as a Research Assistant for Rebuild By Design, studying community resiliency and managed coastal retreat in the aftermath of Superstorm Sandy. Cequyna Moore is an adjunct professor at Hostos Community College where she lectures on the intersection of health, illness, race, ethnicity and the built environment. Cequyna is a graduate of Union College and Pratt Institute’s Graduate Center for Planning and the Environment. Scott Grimm-Lyon is the executive director of GatewayJFK, an Industrial Economic Development Agency in Southeast Queens. Scott has worked in urban planning and community organizing on issues including affordable housing, foreclosure prevention, business displacement, and developing a riverside greenway. Scott has an MS in City and Regional Planning from Pratt Institute, is a graduate of Coro’s Neighborhood Leadership program and serves on the executive committee of the American Planning Association’s New York Metro Chapter. Please fill out the items below to register for the event and hit submit when you are done. You will then be directed to our PayPal page for payment. Check here if you do not wish to receive future communications from ASLA-NY about upcoming events and programs. To receive Member pricing, please list your ASLA or APA-NYM / AICP Member Number here. If you are not a member, leave blank.